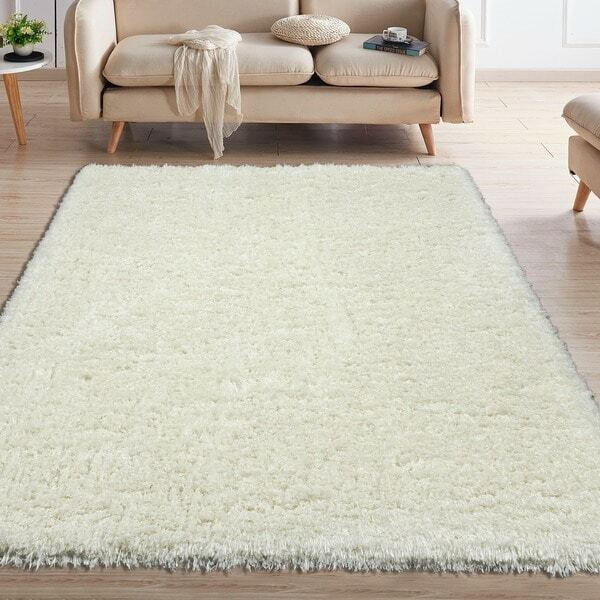 Ottomanson Soft Cozy Contemporary Solid Cream Shag Rug - 7'10" x 9'10"
The Ottomanson Flokati Faux Sheepskin area rug is designed perfectly for a sleek transition into sophisticated, contemporary style decor. Silky smooth, ultra-plush and soft to the touch, this quality high-pile rug will, with no doubt, create an inviting environment for you and your guests while providing de luxe comfort underfoot. Accent your decor with this sumptuously soft area rug that is sure to combine warmth and elegance in your living rooms, bedrooms and kids rooms. As a great escape from hardfloors, this dreamy rug is designed to pamper you, your kids and pets with cotton-soft and ultra-plush comfort. Manufactured in Turkey with exquisitely firm construction in the pile and backing for exceptional durability and longevity. Sturdy high-pile made of %100 premium quality polypropylene and jute backing, this rug is pet and family-friendly. The flokati area rug offers easy upkeep due to its naturally stain, fade, wear and shed-resistant pile material which stands up to a lot of traffic. Lavishly textured pile of this beautiful Turkish rug gently caresses your bare feet and creates a comfy landing spot next to your bed, by your sofas or fireplace, in your foyer or hallways. You can have peace of mind - Ottomanson earned customers' spurs and has been a trusted brand for unsurpassed quality and style in the area rug category. Care Instructions: Super easy to clean, this rug is made of premium polypropylene material which is naturally stain-resistant. Spot clean for any stains or spills. Immediately and gently remove excess liquid with a paper towel or a clean, dry cloth. Follow by blotting with a damp washing cloth and a mild detergent. Vacuum regularly to allow for a fresh look! Should you get a rug smell when you first roll out the rug, ventilation by opening all doors and windows, or with AC or a fan, is the best means to get rid of it. Exact Size: 6'7" x 9'6"
Dimensions 94.0 In. X 11.0 In. X 1.2 In. decor. Silky smooth, ultra-plush and soft to the touch, this quality high-pile rug will, with no doubt, create an inviting environment for you and your guests while providing de luxe comfort underfoot.